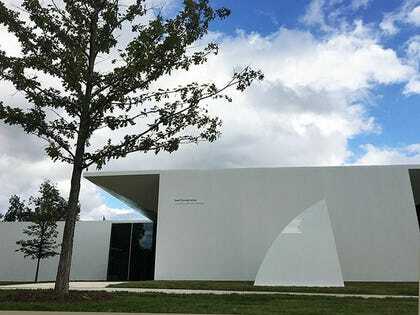 As crisp as a fresh sheet of paper awaiting an artist’s mark, a new building housing The Menil Drawing Institute (MDI) has opened at the Menil Collection in Houston. Designed by Johnston Marklee with landscape architects Michael Van Valkenburgh Associates, the $40 million free-standing facility of 30,000 SF is the first to be built expressly for the acquisition, study, exhibition, conservation and storage of modern and contemporary drawings, the project announcement noted. It’s the fifth building for the 30-acre campus of art facilities, landscaped parkland and meandering pathways. As a program that has been part of the museum since 2008, MDI had previously organized traveling exhibitions and scholarly projects. The building is its new, permanent home and accommodates what museum sources ranked its fastest-growing body of work. Prior to the opening, Menil Collection Director Rebecca Rabinow reflected on the museum’s commitment to its founders belief that “art is essential to human experience.” The quiet, innovative architecture of MDI “allows us to make drawing, the most personal of all artistic practices, accessible as never before” to artists, scholars, students and the public, whether they come to visit or explore, she said. Rising 16 ft. from its 17,000-SF footprint, the building bridges the scale between the museum’s main building — a celebrated 1986 design by Renzo Piano — and the gray-painted vintage bungalows around the campus, located in a residential neighborhood developed a century ago. The MDI design “modulates sunshine” to shield works on paper from harmful light but also illuminate interior common areas. A pair of open roof exterior courtyards provide building access and gathering space, and there’s an interior courtyard “cloister.” An external canopy also helps baffle natural light (and Texas heat). MDI’s location is considered the “centerpiece” on the south side of campus, which has gained a new park, also designed by Michael Van Valkenburgh Associates. It features a large deck for outdoor performances and video projections. MDI is the first new building on the Menil campus in 20 years. It joins the main building, the Cy Twombly Gallery (also by Renzo Piano), the site-specific Dan Flavin installation at Richmond Hall and the Byzantine Fresco Chapel, designed by Francois de Menil. The latter is a venue for long-term installations of contemporary art. The MDI building is named in honor of Louisa Stude Sarofim, Menil Foundation chair emerita and life trustee. MDI’s inaugural installation is “The Condition of Being Here: Drawings by Jasper Johns.” The Menil is one of the largest repositories of the artist’s drawings.